“In the heady post-millennium days, when funding was relatively easy to obtain – arguably too easy – banks were fiercely competitive. It was usual for banks to fight to take each others’ customers and entice new clients with deals which would fuel the bank’s own growth. “For many business owners, those days are a distant memory as the banks demand businesses jump through bureaucratic, time-consuming hoops to borrow, and agree to additional costs such as increased rates and set up fees. “A recent survey by Institute of Chartered Accountants in England and Wales said that many small companies feel ‘bruised’ and ‘scarred’ by the way they have been treated by their bank during the recession. “It’s not surprising that, in turn, business owners may consider changing banks – but is the grass greener on the other side and how can you select the right bank for your business if you consider changing? “Individual banks do have their respective strengths and weaknesses and many have landed in differing positions in their support of SMEs since the downturn. “Corporate finance professionals and accountants should be able to guide their clients towards the right bank for their respective needs. “For example, if you are an owner manager then finding a bank which operates well in that space is key. “You should be looking for a bank which will handle day-to-day transactional business in the sub £10 million market place, with best in class service, internet banking offerings and well-versed in the particular sector to understand the business. “It’s important, at the same time, to understand that there are sectors where specific banks may be capped on their exposure. “For example, a client who wished to invest in property, the leisure sector or licensed premises may find some banks unable to assist because they have already reached their cap on exposure to those sectors or trades. “The business owner should try and endeavour to find out which banks can be supportive of their sector rather than concern themselves with pursuing discussions that will ultimately not bear fruit. “One of the more notable and interesting sources of funding is the Enterprise Finance Guarantee scheme. “It’s not for companies which have struggled during the recession, but for new-starts, existing trading businesses, development capital and can even be utilised as part of a merger or acquisition. “Essentially, any business or transaction with demonstrable profit and cash fundamentals but a security shortfall can access the scheme. “Specific banks have developed in-house expertise within this area and other similar government initiatives and they can improve the availability of working capital through term loans and the consolidation of overdrafts. “Again, however, each bank has a slightly different approach to their willingness to pursue the EFG scheme and their application of the scheme rules. “For businesses in the North-east it is worth checking out just what level of presence a bank has locally. “The bank footprint here may be predominately in retail banking and the corporate arm of the bank may be far removed perhaps meaning less capability for larger transactions or debt requirements. “There are also new entrant banks – some with HQs in the Scandinavian countries – well worth investigating. Because of their countries of origin, some have excellent experience in oil, gas, energy and fishing. “It may be hard for some business owners – especially the ‘bruised and scarred’ to believe it, but there are still some banks out there which are strong in the corporate and leveraged space and they have cash to lend and a positive attitude to engage with businesses. “Much in the world of finance takes longer than it did pre-2007, so businesses who consider changing banks should do their homework on which banks will suit them long before finance requirements arise. 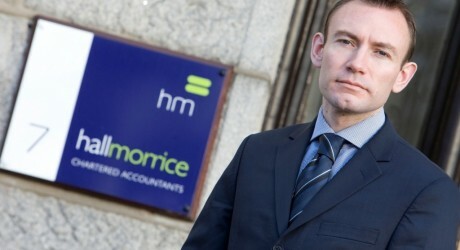 Scott Taylor is director of Corporate Finance at Hall Morrice accountancy practice. Hall Morrice, founded in 1976, is one of the Scotland’s leading independent firms of chartered accountants and has offices in both Aberdeen and Fraserburgh. Hall Morrice is based at 6 and 7 Queen’s Terrace in Aberdeen and can be contacted on 01224 647394 or at accounts@hall-morrice.co.uk.